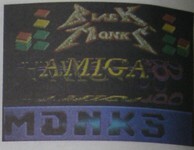 Demo competition announced at the AMIGA '89 expo by the commercial German Amiga magazine "Amiga Special". Groups that participated were Sunlight, D-Tect, and Black Monks (who submitted five entries). The winner was chosen by the magazine staff - the other entries received no placings. The results were published in the magazine's issue 3/1990.